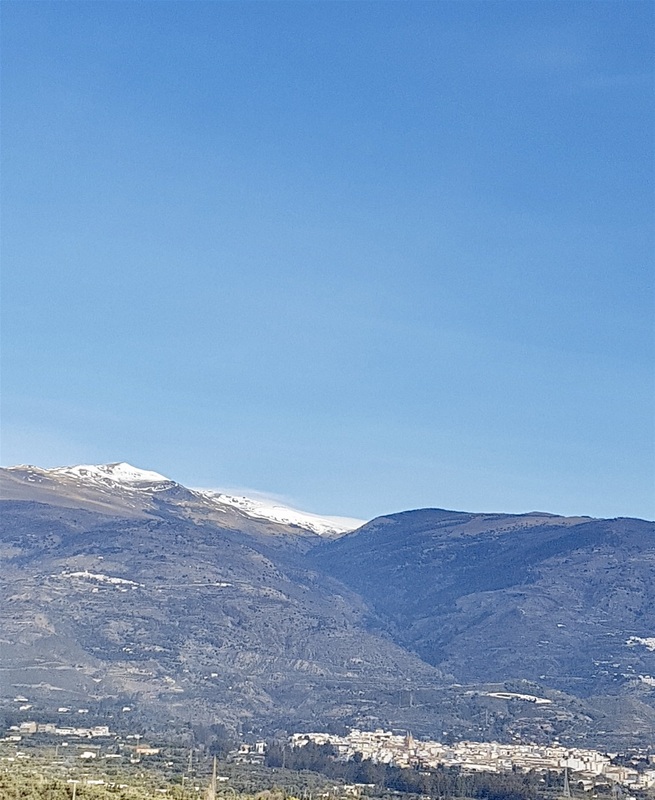 Las Alpujarras. Visiting Medieval North Africa without crossing water. 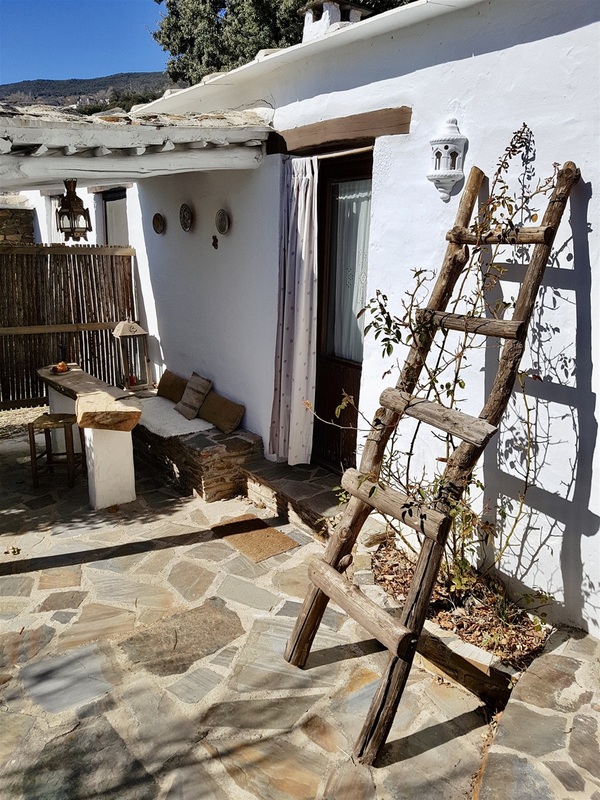 Las Alpujarras is a region like no other in Spain. 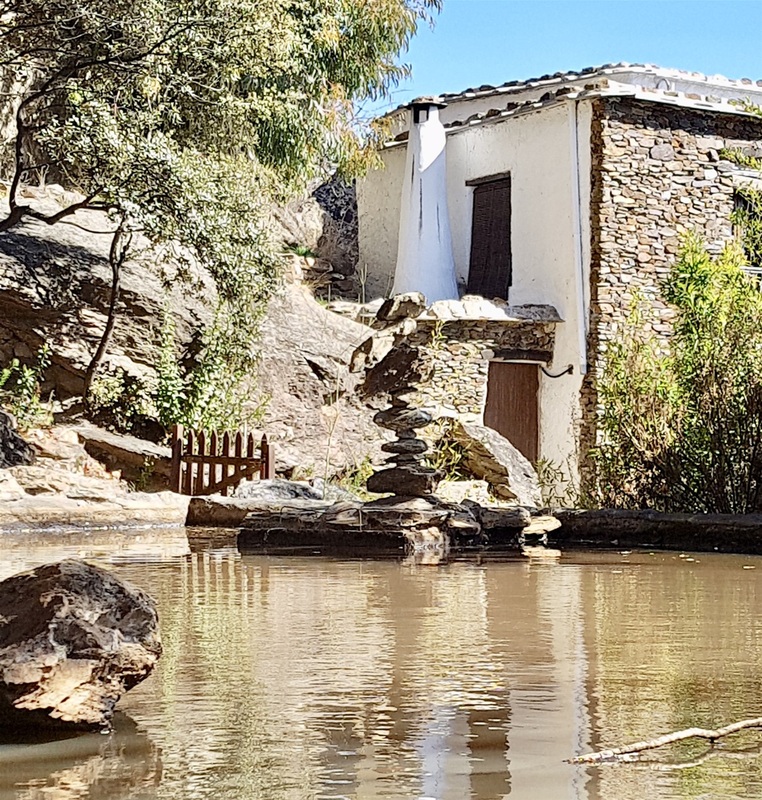 We’ve visited Berber villages in the High Atlas Mountains, but there’s no need to make the long trek through Morocco to see very similar villages, hidden away in the mountains south of Granada, in Southern Spain. We love it here, but all our previous visits have been in the summer months where the high mountains and perched white villages are a relief from the baking heat. It’s February now, there’s snow on the hills and we’re not sure what to expect. This region was the last refuge in Spain of the Moors of the El Andalus kingdom. Long after Boabdil, Granada’s final sultan, was thrown out of Granada in 1492, bands of rebels were still waging a guerrilla war from the isolation of their mountain strongholds in the Alpujarras. It was to be another eighty years before the Moorish presence in Spain could truly be said to have been extinguished. 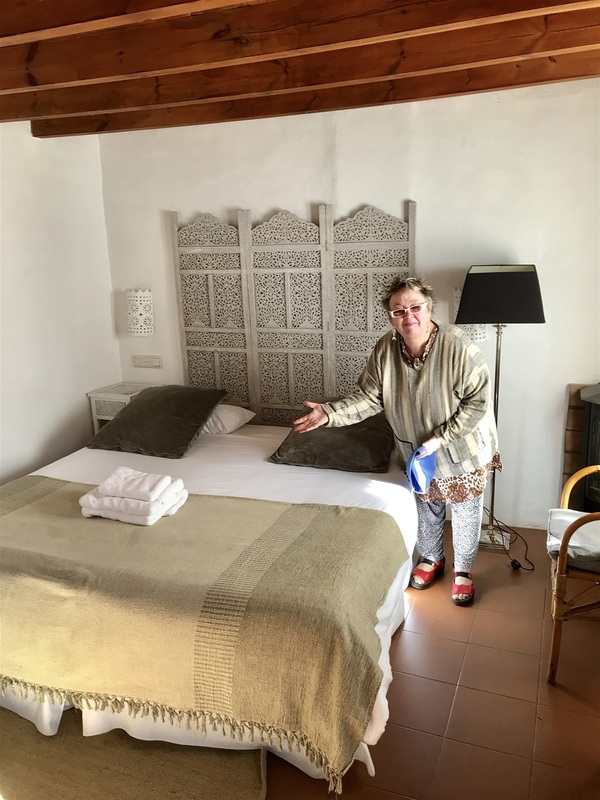 This Moorish influence is most evident in the place names, the traditional North African artisan crafts that thrive here and the plethora of flat-roofed, Moroccan-style houses that typify the numerous villages that define the region. The High Atlas, or the Alpujarras, I’d be pressed to tell the difference, from a distance. Up close, the difference is evident: this region may have medieval architecture, but the roads are good, there’s a bus service and even a decent Wi-fi signal. Not much evidence of any of that in the High Atlas. The publication in 1999 of Driving over Lemons, an account of rural simplistic living on an isolated farm near Orgiva had a significant effect. 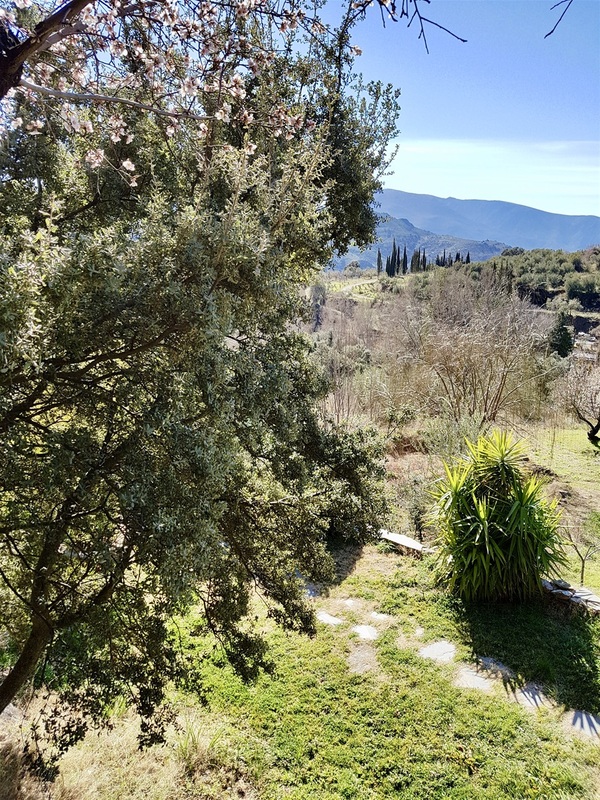 Much as Peter Mayle introduced Provence, particularly the Luberon region, to a wide readership, prompting an instant surge in house ownership and bring tourism to the area, so it was with the Alpujarras. 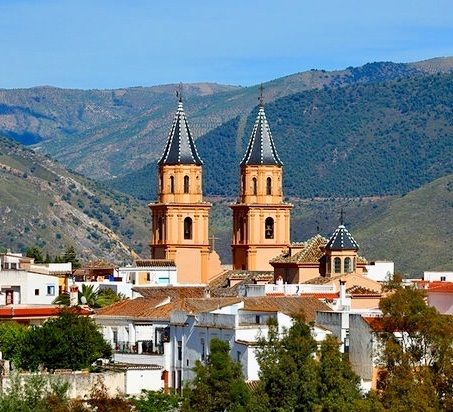 A personal view: South from Granada: Seven Years in an Andalusian Village, an autobiographical book by Gerald Brenan, first published in 1957, is a far better read. Its subject matter is life in these villages during the 1930s and much of Brennan’s writing still resonates with us as we drive around here today. A good few years back, we spent a few weeks in Calpe. This was pre Internet era, pre Sky tv, so the evenings were long. We took ourself off to the local cinema, long since closed to the surprise of none, to see an English language film, Carrington. We remember the evening vividly for the half time ‘interval’ where the projector stopped, jerkily, in mid frame and the entire audience trooped off to the foyer for free coffee, a slice of cake and a stiff brandy, all included in the ticket price. You don’t get that at your local Odeon. ‘Carrington’ is Dora Carrington, a talented artist and the film details her relationship with Lytton Strachey, the author of Eminent Victorians, one of my favourite ‘serious’ books. Strachey was a founder of the Bloomsbury Set and one of its peripheral figures is Gerald Brennan. We loved the film and the next two books I read were Eminent Victorians and South from Granada. 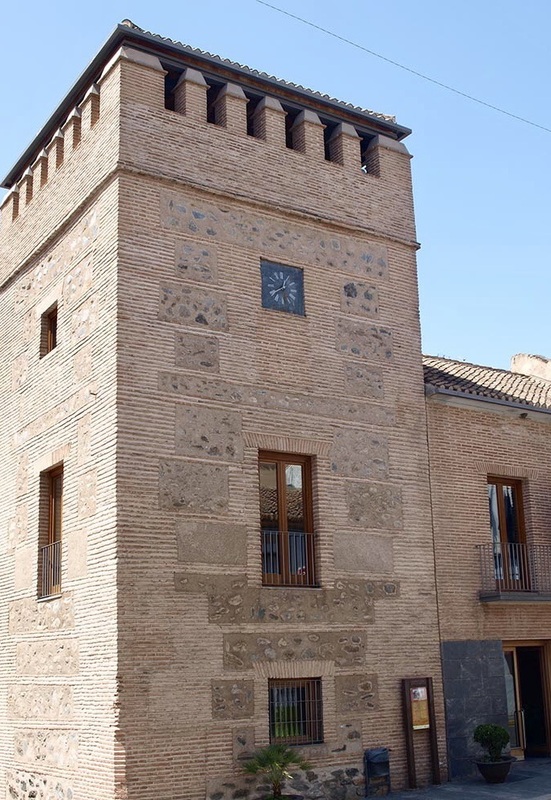 We start on familiar ground, two large villages or small towns, the biggest and most affected by tourism in the region being Lanjarón and Órgiva. Lanjarón is the first village on the road into the Alpujarras from Granada. We cross the Tablate Bridge which marks the official start of Los Alpujarras. This bridge was the site of a fierce battle between Moors and Christians in 1569, seventy-seven years after the last of the Moors were supposed to have been sent back to North Africa in full retreat. There’s a ruined castle here as a reminder of times gone by, dating back to the eighth century when the splendidly named Yusuf the First served as Sultan of Al Andalus. Pretty impressive claims as in reality Chalybeate water is basically nothing more than plain old water enriched with iron deposits. 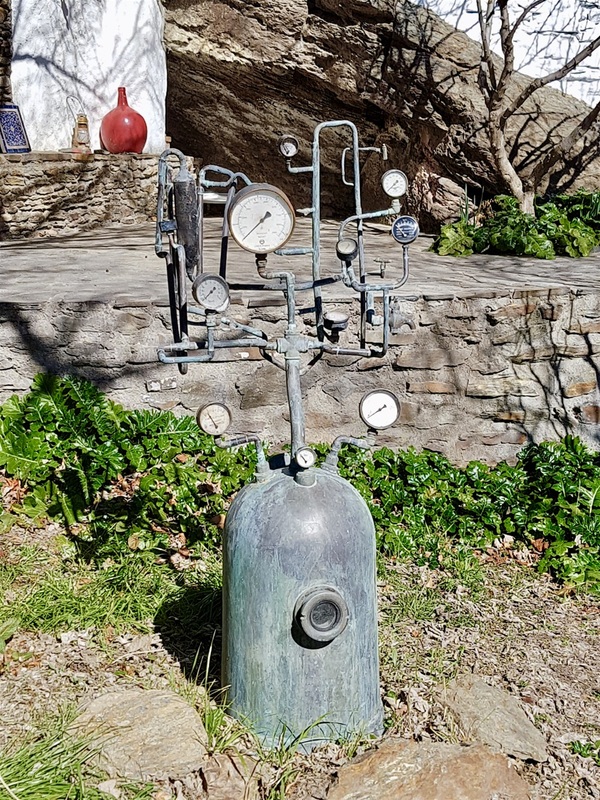 We don’t notice anyone skipping around shouting ‘I’m cured of those flat worms in my belly,’ but tourists and spas, seven natural springs in the town, are a heady mix and there are more hotels here than anywhere else we’ll visit on this trip. Obviously, we’re not staying here. Tonight we shall be spending a night in rustic style somewhere very different. As yet I haven’t found the ‘actual village’ on any map, so let’s hope we find the place before dark. One of our ‘friends’ emailed us recently, pointing out how ‘bourgeois’ we had become with our patronage of five star hotels. One night in a five star hotel and we’ve lost our street cred forever! Never mind that we only paid a two star price at the aforesaid accommodation, the damage is done. Don’t worry about us, mind your own business, as we’d love to say, but Voltaire’s wisdom is written in French, so much less likely to offend. As confirmed hodophiles, the act of travelling being far more relevant to overall enjoyment than where we choose to lay our heads at night, we’re going very, very rustic tonight. As far removed as can be from five star. Bourgeois? Not likely. How very dare you? The issue may be thought complicated by tomorrow being Valentines Day. 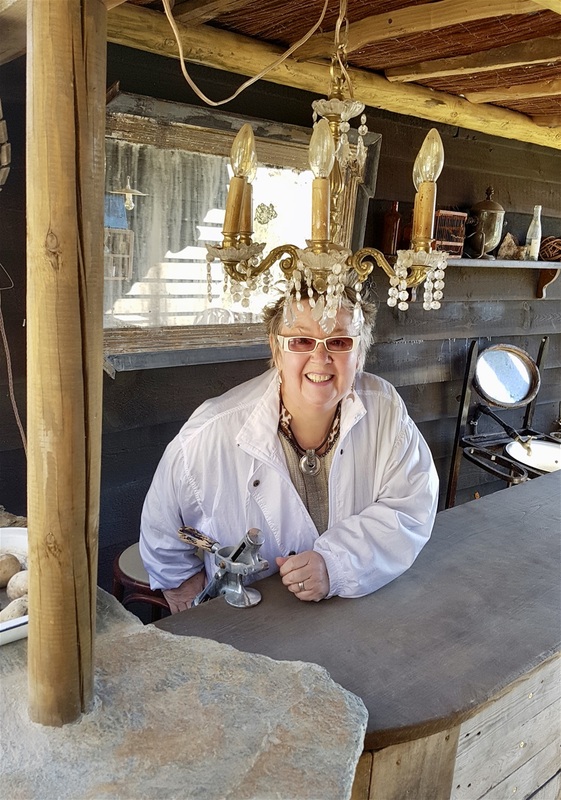 Some may question the wisdom of choosing a resting place very far removed from any semblance of ‘luxury’ for one’s beloved to awaken in on Valentines morn, but Marigold is no ordinary woman! Órgiva has a thriving ‘hippie’ population and a brilliant Thursday market, but today it’s far less frenetic than we’ve seen in the past. We’ve got friends here, but a quick dash around their usual haunts fails to find any trace of them. They’re van dwellers so may have moved on. Maybe next time. 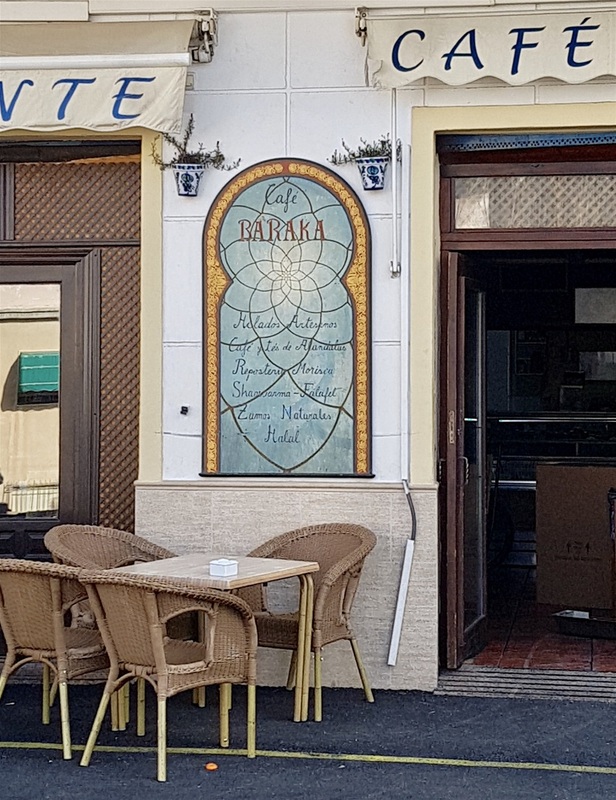 We stop and look around at the Molinos de Benizalte, a 15th century Arabian oil mill which is always fascinating and then take ourselves off to one of our favourite places in Spain, Café Baraka, just above a car park in Órgiva. 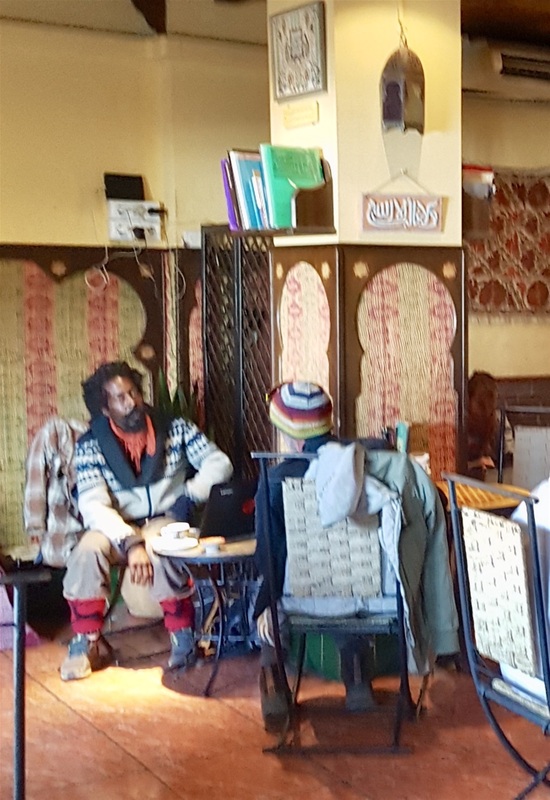 We first discovered Café Baraka – ‘baraka’ means ‘blessing’ - almost twenty years ago and are relieved it is not merely still here but thriving. Step inside and it’s just like being in Fez or Marrakesh. 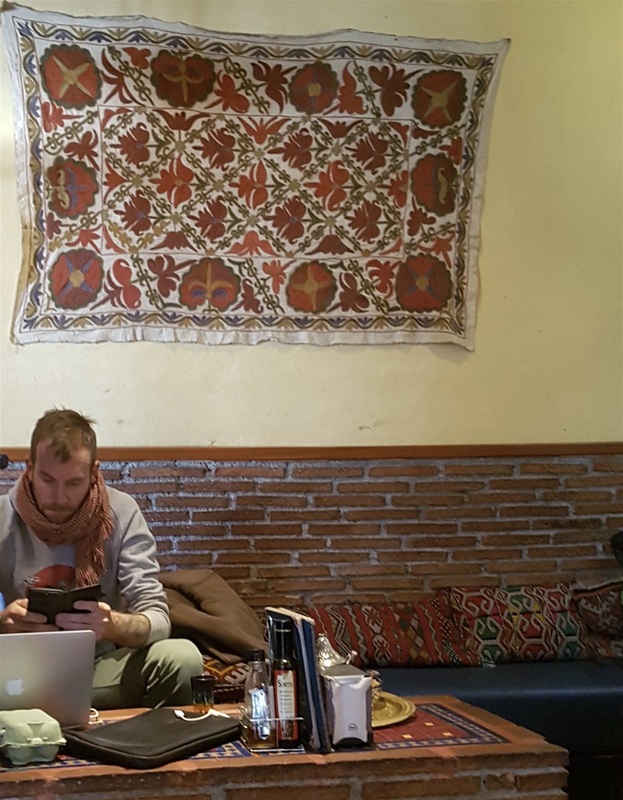 Most of today’s customers are wearing dreadlocks, have multiple piercings and wear baggy clothes, this is Órgiva, a ‘hippie’ stronghold, all busily engrossed in their laptops. 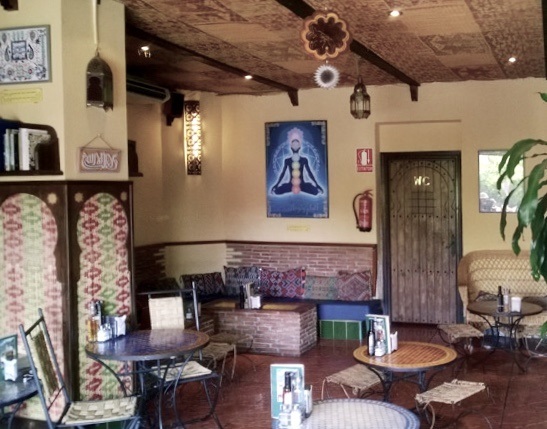 Café Bareka is owned by a Sufi Moslem, there are copies of both the Bible and the Koran on the bookshelves, and this is just one of the many ways in which this place encapsulates the diverse nature of Órgiva. The town’s population is a little under 6,000, but includes 68 different nationalities amongst those ‘reigistered as residents’ as well as a sizeable Buddhist community and a sprawling and long established ‘Rainbow’ collective just outside the town called Beneficio of which more anon. 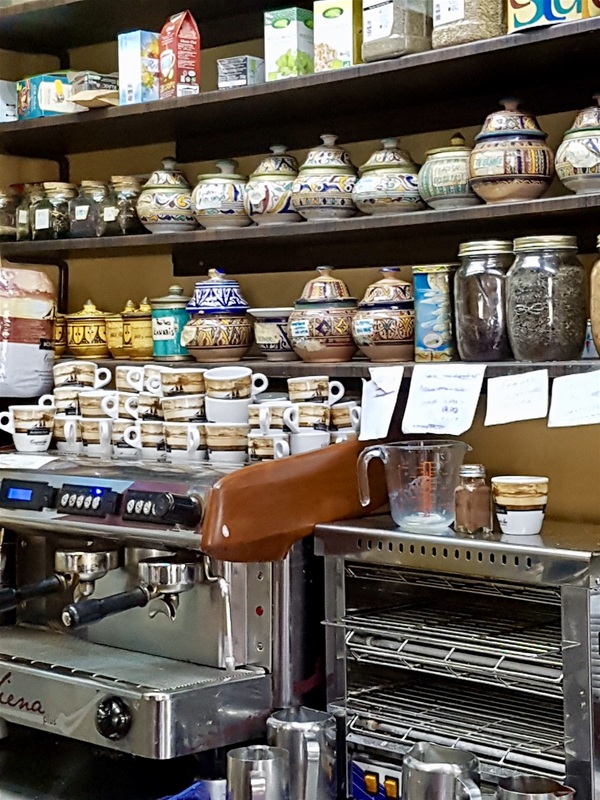 We order our meal from the vast choice available and Marigold takes an age studying the list of thirty-six different varieties of tea before deciding on café con leche! No alcohol here, but if you’re vegetarian/vegan you’re in paradise. They do serve meat though, halal meat where requested, almost everything on the menu is ‘organic’ and there’s not a microwave oven in sight! . A man with a mass of curly hair and a very dark long beard sits behind us. He’s very black, very big and very exotic looking in flowing robes and a bright headband. He also has a broad Irish accent. No, it doesn’t pay to judge by appearances. He tells me to order baba ghanoush as it’s ‘superb here.’ We last ate baba ghanoush, basically mashed baked aubergine with garlic, spices and lemon juice, in very different surroundings in Bristol and were massively disappointed. His meal arrives and does look enticing, but not sufficiently so to convince us. 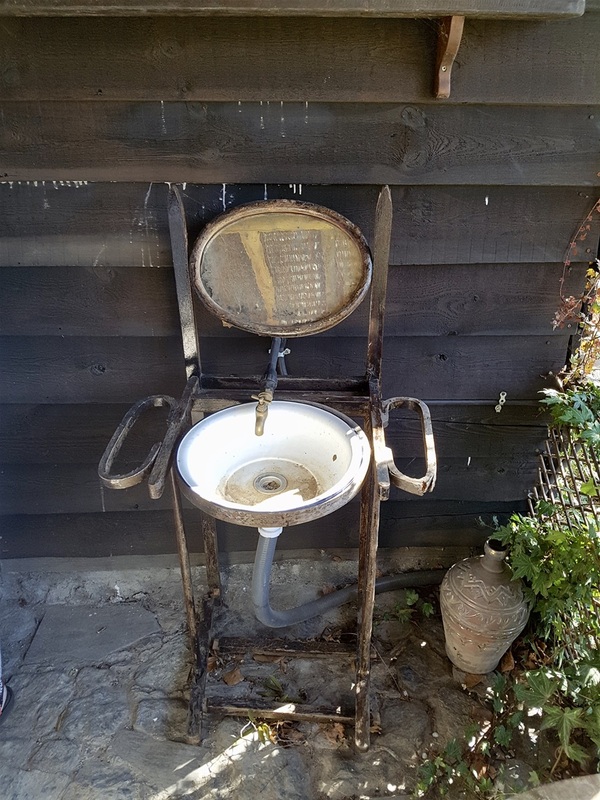 Three girls, older teens, who we’d passed on the way up from the car park, sitting cross legged on the stone steps comparing their piercings, come inside and take an age deciding where to sit. Choosy over which padded sofa or bench to sit on, yet happy enough to sit on the floor outside. They’re wearing billowing tie dye dresses, thick socks and heavy, lace up boots and I imagine they think of themselves as rebels against convention. Marigold catches my eye and we share a conspiratorial grin. Marigold dressed exactly like that in the 1960s, back when my hair was longer even than that of the dreadlocked hippie in the corner seat. Been there, done that. The teenage ‘rebels’ order toast and jam, speak English with Home Counties convent school accents and gaze adoringly at a couple of (male) Danish backpackers who turn up along with their bikes, a hairy dog and all their worldly goods. Everybody moves up to let them in and the waiter brings over a bowl of water for the dog. No wonder we like coming here. 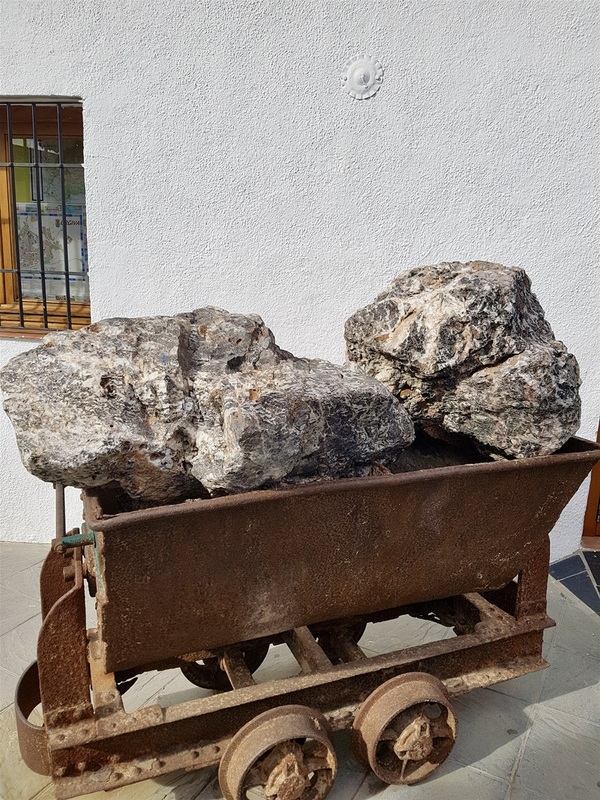 We go for a walk around Órgiva in the sunshine, much warmer here than it will be later in the mountains, and have to cross over the road pretty smartly when a Guardia Civil van screeches up alongside two scruffy young men, several officers climb out and push the men up against the wall. It looks pretty drastic, but is over almost as soon as it starts. The men show some documentation, turn out their pockets and are soon released. It’s break time at a nearby school and the released men get a round of applause. Last time we were in Órgiva I got the impression the townspeople were becoming less tolerant of their near neighbours which Kurt confirmed. Things escalated a few months ago after an American tourist claimed to have been sexually assaulted by a member of the commune. Kurt said the allegation was ‘a load of bull’ but police raided the camp, arrested about twenty people and brought over a hundred charges against the community members. ‘Including me,’ Kurt added. We refrained from asking for details, but he told us anyway. I’m enough of a cynic to know there’s more than one view of any situation, but this did sound fairly trivial. ‘Were most of the charges like that?’ I asked. Kurt frowned. His chosen lifestyle presupposes a certain bias against him by authoritarian figures, but he’s obviously trying to be fair. As we were leaving, Kurt called after us, ‘they never found my little garden though’ and laughed. Later on we picked up some more detail on the raid. The man accused of murder was aged 23 and still had his wife’s phone in his possession which was how the police traced him. 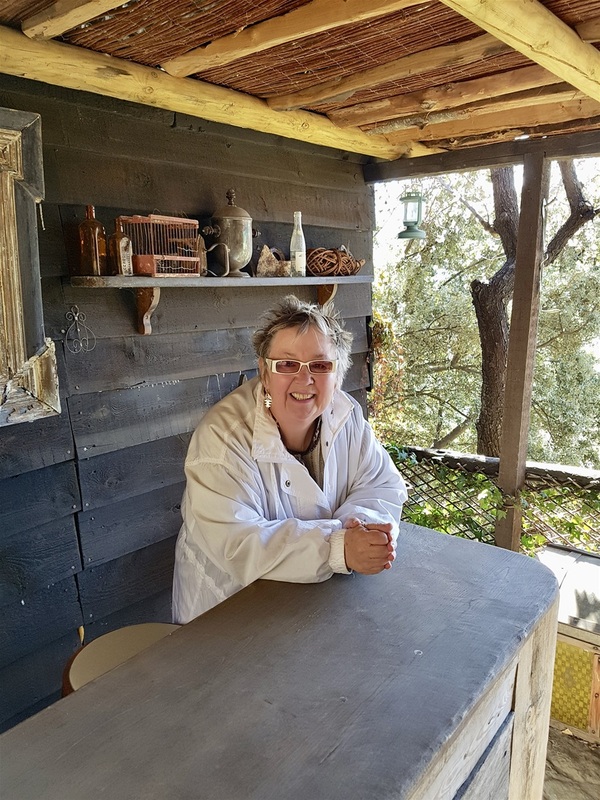 A woman waiting for the tourist office to open told us most of the other charges had been dismissed and the only ones left related to diverting water supplies or the digging of illegal wells. She added there had been uproar in the town over what they regarded as overzealous police action. Dozens of police vans invaded the site, along with a helicopter and the scene we had just witnessed was all too common. She dismissed the allegations of the American tourist as ‘fanciful’ and had never heard of any arrests connected with this complaint. Beneficio is a fascinating place and when we’ve been before we’ve always been welcomed. It reminds us of a hippie community on the outskirts of Copenhagen we spent a few days in, but Beneficio is much more ‘authentic’ in my view and certainly more attuned to the lofty ideals of its founders. Last time we were there, Marigold said, ‘if we’d found this place when it first started up, we’d still be here.’ As ever, she’s probably right. It helps to take something along as a present for the community. Last time I offloaded fifty or so spare books. It’s entirely self sufficient. There are no mains services, but a modicum of civilisation exists as there’s very considerable use made of solar power and wind turbines for power. We don’t want to risk another raid so we decide against a visit today, time is getting away from us and I still haven’t the faintest idea how to get to where we’re spending the night. Beneficio isn’t the only ‘hippie’ hang out in Orgiva; there’s another campground, rather less well known place called El Morrion which we’ve visited only once, but it’s rather charming with numerous dogs and young, happy children running around. Not so many rules as Beneficio, much more laid back and far less emphasis on spiritual enlightenment. 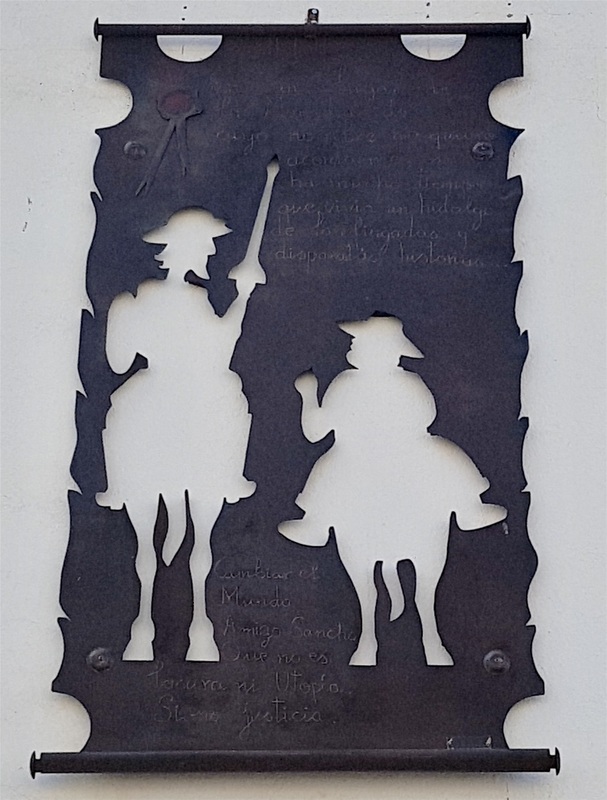 We’ve spent some time in La Mancha recently where Miguel de Cervantes Saavedra, always referred to as simply ‘Cervantes’ set his classic novel, Don Quixote. Widely regarded as the first modern novel, Don Quixote has been translated into more languages than any other book except the Bible. 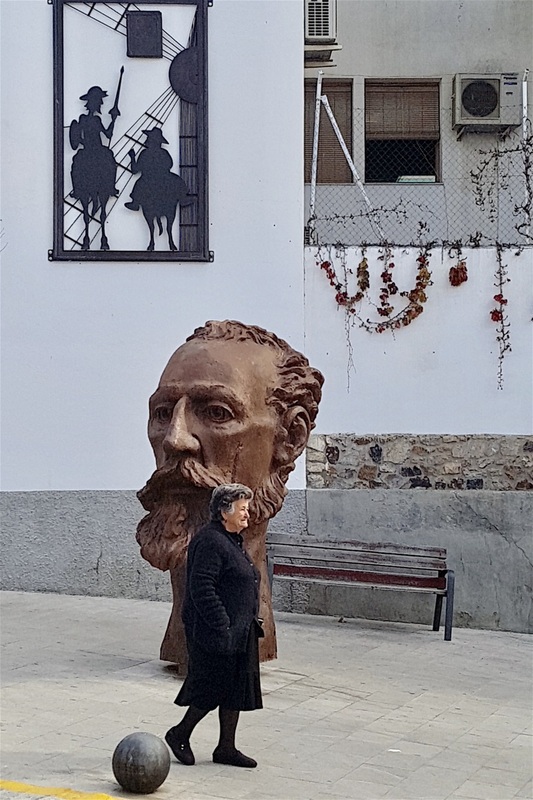 Cervantes died in 1616, but he’s the Shakespeare of the Spanish language and we saw effigies of the writer and his best known characters, Don Quixote and Sancho Panza everywhere we went. 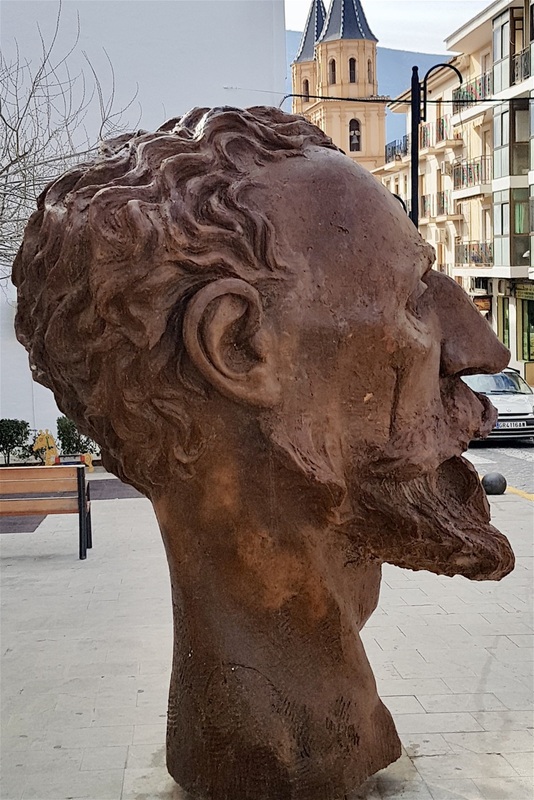 Okay, this is Spain’s most famous literary figure, but why is there a massive bust of Cervantes in Orgiva? I waited ages for a lady in funeral black to walk alongside the bust in order to give an idea of its size. She walked so slowly Marigold wondered whether the old lady was a statue herself. Back in 1967 the local librarian, Agustin Martin Zaragoza, started to encourage people and institutions to send him copies of the book Don Quixote. Today the collection, housed in the library and available to anybody who wants to read them, stands at books translated into 82 different languages, far more than anywhere else. 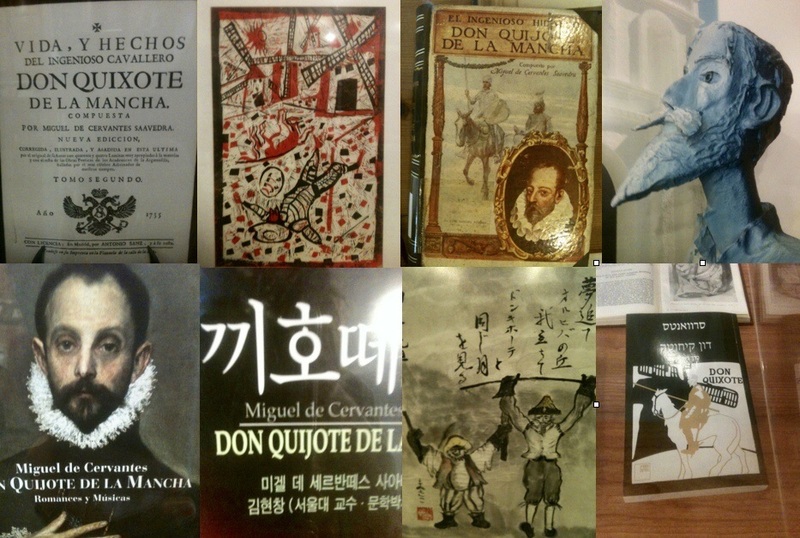 They’re still looking for more as Don Quixote has been translated into 140 languages and dialects. The ‘next best’ collection in Madrid where Cervantes is buried only contains translations of 59 languages. Anyone can see the collection, we just asked at the reception desk, and there are over 150 editions of the novel on display along with many other books, papers and essays together with numerous biographies of Cervantes. There’s artwork and sculptures in here as well. It made me want to read the book again. Marigold’s reserving judgement, for now. Wonder if there’ll be a library devoted to Driving over Lemons in a few hundred years time? I rather doubt it. The book’s full title in Spanish is ‘El ingenioso hidalgo don Quijote de la Mancha‘ – Not exactly catchy, is it? I noted two copies that had been signed by members of the Real Madrid and Barcelona football teams and another copy signed by King Juan Carlos I during an official visit to Órgiva in 1994 – although that copy had already been donated by him to the Orgiva library from his own collection. Nobody asked us to sign anything. We drove along the road overlooking the El Morrion camp on our way out. 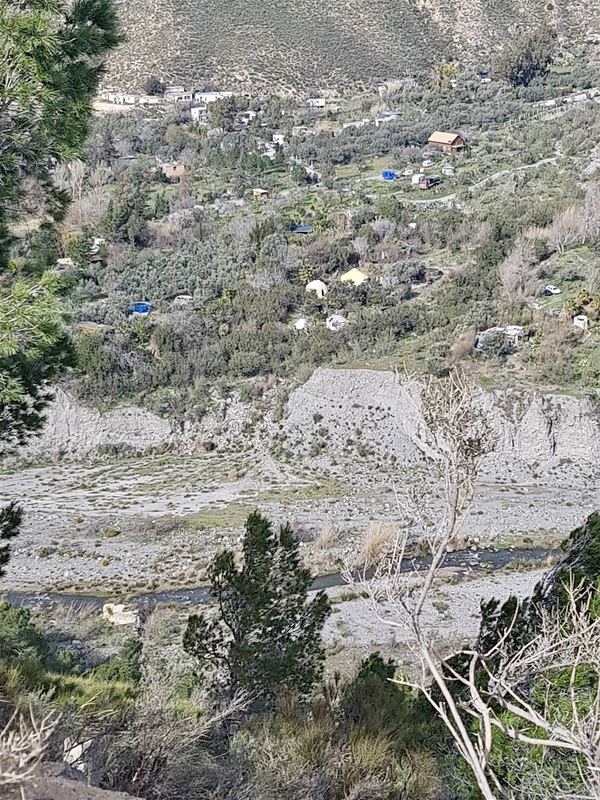 There are numerous vans parked up all along the valley, a couple of communal ‘big tents’ and a fair few buildings that appear ‘almost’ permanent. Hippy communes behind us we decide we must put aside lofty ideals of peace and harmony and, selfishly, go off to find our place to spend the night. I’ve already assured Marigold that even though a yurt was available in the same area I had booked a one bedroom house. The house took some finding, it’s down a narrow and precipitous track, and is just about as remote as is possible to find. We see a very smart house coming into view, but of course that’s not it and we have much more of this narrow track with an unfenced sheer drop on one side to go yet. We’ve climbed up through the mountains by now, it’s late afternoon and bitterly cold. The shade temperature shows as two degrees, but when we get out it reminds us of a day we spent at Europe’s most northerly point, Denmark’s North Cape when even the reindeer were shivering. The woman who meets us there is lovely, there are four cats, a ridiculous dog, hammocks and a tiny one roomed house with a bed, a ‘kitchenette’ and a small bathroom. When we’re on our own, I look at Marigold and we both start laughing. ‘I love it,’ she says. We both agree the yurt would have been a very bad idea as the house has thick stone walls, a solid flat roof and it’s still freezing! 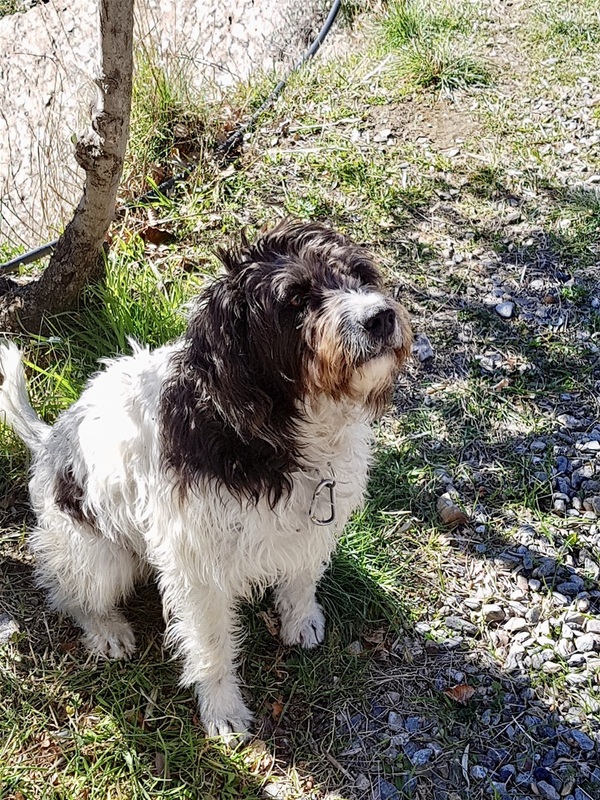 The friendly dog, a bearded collie with matted fur and a lolling tongue, turns up, rolls around in the dust and tries to climb up onto my lap. He’s a real character and takes us off for a walk.